CSS staff at EPA's Western Ecology Division have contributed to new research on the ecotoxicity of nanomaterials, in support of the EPA goal to develop tools/methods to assess, monitor and predict changes in terrestrial ecosystems in response to nanomaterial exposure. Nanomaterial effects research is complicated by the need to develop research protocols to elucidate that the observed effects are in fact due to the nanoscale nature of the material being tested and not simply to the macro-scale toxicity of the chemical. Our staff are developing and evaluating protocols for mixing nanomaterial solutions that have a consistent and defined particle distribution for effects studies. Staff use state-of-the-art imaging and spectroscopy instrumentation to characterize nanomaterial solutions. 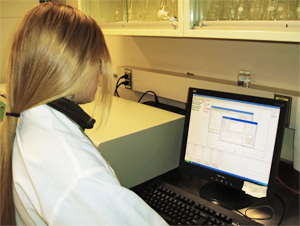 In addition, CSS staff have developed protocols for identifying nanoparticles on plant tissue samples using scanning electron microscopy and x-ray spectroscopy; investigated the effect of nano-sized titanium dioxide and cerium dioxide on seed germination and plant growth; and developed health and safety protocols for working with nanomaterials.